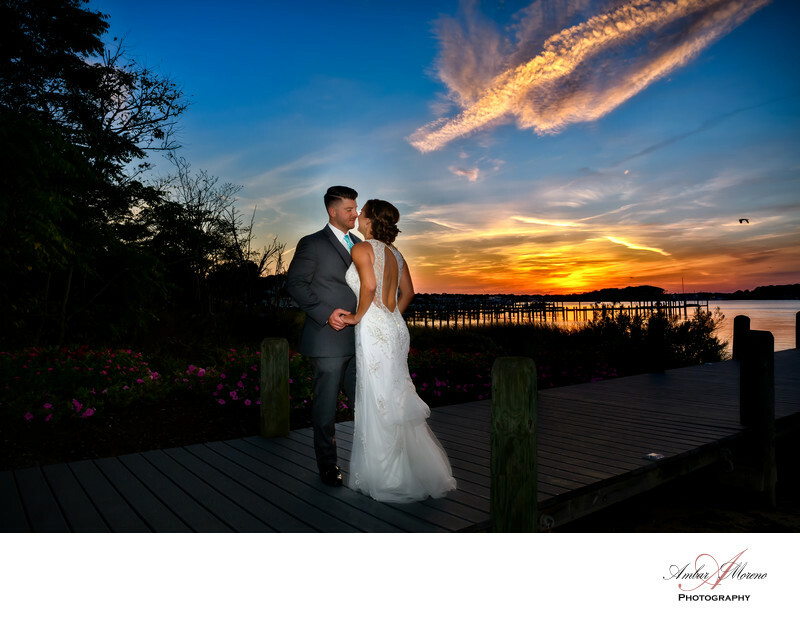 Clarks Landing Yacht Club is a beautiful wedding venue. The view to the bay is breathtaking. The venue is so lovely inside and the decor is elegant. It was such a beautiful celebration. The Greek culture has such deep rooted love not only for their culture, but for the people. Every wedding is a joyful celebration. The pier that extends out to the bay lends itself to a perfect location for photos. The sunset and deep blue skies can be seen for miles. The view from the pier or from the ballroom are equally beautiful. Photographing a couple during sunset on the pier turn out to be a romantic spot. The food is also spectacular. All the different types of food is amazing. The presentation of the food is a culinary art that has to be seen to be appreciated. The staff at the venue are equally courtious and eager to provide the best service they can offer. Location: 847 Arnold Ave, Point Pleasant, NJ. Keywords: Clarks Landing (3), Point Pleasant (3), sunset (3), yacht club (3).